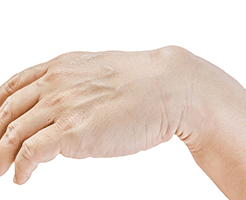 Ganglions (sometimes called ganglion cysts) are common lumps that appear on the fingers, hand or wrist. They are herniation of the lubricating fluid in the joint or around the tendons, through a small defect that act as a one way valve. The fluid then becomes thick and gelatinous (mucoid degeneration) as the lump enlarges. Ganglions are usually not painful but as they enlarge they may start to stretch nerves or tendons, distort the nail and cause discomfort / concern. They may also become quite unsightly. Ganglions may rupture spontaneously and shrink /disappear for a while before re-appearing again. This is the source of the old fashioned treatment “hitting it with the bible”! They typically occur around the back wrist (70%), the front of the wrist (15%), the end joint of the fingers /thumb (10%) or the base of the fingers (<10%). The good news is that we don’t hit them with the bible anymore! Some may disappear spontaneously and others may be small and not troubling the patients. These do not need any treatment. For larger and troublesome ones, the treatment of choice is surgical removal, although injection of steroid into the ganglion can be a temporary alternative. The procedure is performed in an accredited hospital under a light general anaesthetic or local anaesthetic. Surgery aims at removing the ganglion and the one way valve (tendon/ joint defect) from which the ganglion arises. The procedure is done as a day only procedure without the need to stay overnight in hospital. The hand and wrist is usually wrapped in a splint and bandages and patients are discharged with a sling to elevate their hands. The dressing needs to stay dry and intact for two weeks when Dr Safvat will remove them. Most patients do not need hand therapy but for those who need this, it will be organised after the dressings are removed. All operations have risks and Dr Safvat will discuss these in details with his patients beforehand. In addition there is also a chance that the ganglion may recur despite successful surgery, but this is less than 10%.